I have a friend that would like to purchase my older model Delta Bench-top Drill press which got me considering if I wish to upgrade. 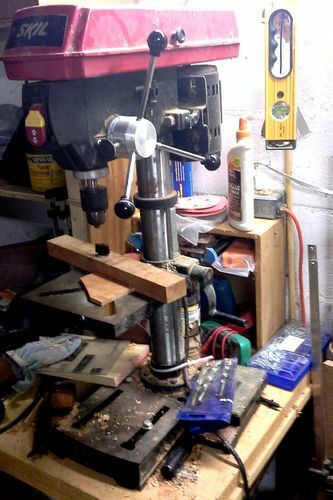 While I do have a Jet floor model Drill press I have liked having my bench-top set with a pilot hole bit. My only real gripe is the table does not have a crank to raise and lower it. Merely pull up and down and set clamp. This has worked for a long time but I often change the height so this is a upgrade. I have a Skil that is three years old & has been a real work horse. It does have a crank and a laser (that I never aligned & don’t use). Its the standard five speed belt drive and I’ve used 3” carbide forstner bits that are at the limit of its capabilities. Thanks. The laser is nice, if you set it up but the crank is the real bonus. I would buy one and give it to him to save the friendship, $50 -$75 is well worth it,this way you still keep your DP and he’ll get one for free but he also will never forget the gesture.